As we enjoy small ship cruising the invitation to visit Silversea’s Silver Wind while she was docked at Tower Bridge in London was met with glee. However, to date the smallest ship we’ve sailed on weighs in at 32000grt, is 198m long with a capacity for 458 guests, but when compared to the Silver wind with a gross tonnage of 17400grt, a length of just 156m and a capacity for 294 guests, that suddenly feels like a giant of a ship. It would be interesting to see if our penchant for small ship cruising be tested by a much smaller ship and so we eagerly accepted the invitation. Now one of the unique benefits of small ship cruising is that they can get into places that larger ships just have to wave to from afar. And never was this more true than the location of our ship visit, up stream of the infamous Tower bridge in London, docked alongside the HMS Belfast looking over the majestic Tower of London. Although Tower Bridge is still raised nearly 1000 times a year to allow ships and barges to pass under her, fewer and fewer of these are for passenger cruise ships. With cruise ships becoming generally larger a new cruise terminal is under construction further down the river at Greenwich so docking at Tower Bridge is really something very special and may become a real rarity in the not too distant future. The Silver Wind docked alongside the HMS Belfast. We we arrived in London on a grey and blustery Tuesday morning and made our way on foot across London Bridge towards Millennium pier for embarkation. And what a view greeted us as we crossed the bridge with the Silver Wind moored up beside HMS Belfast and Tower bridge towering behind her. From millennium pier it was then a short boat ride across the river to a platform on the HMS Belfast which we had to board in order to gain access to the Silver Wind - one of the strangest, but coolest, embarkations we have ever made. 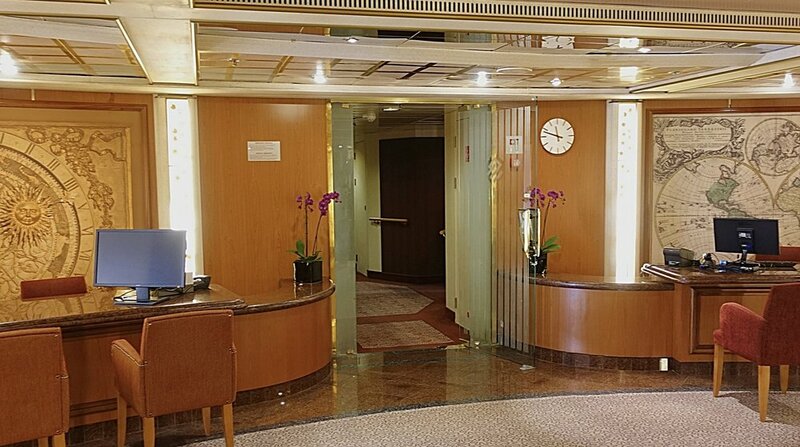 We entered the Silver Wind on deck 6 at the central lobby, a stylish and understated central atrium which houses the reception desk, the shore concierge desk and a future voyages desk - everything you need all in one central area. From here we made our way up to deck 8 for a welcome drink in the Panorama Lounge, and what a panorama it was today with a view directly over the Tower of London, Tower bridge and City Hall. As the ship sheltered us from the blustery weather and the clouds started to break up we spent a leisurely hour sipping champagne on the outside aft deck soaking up that magnificent view. 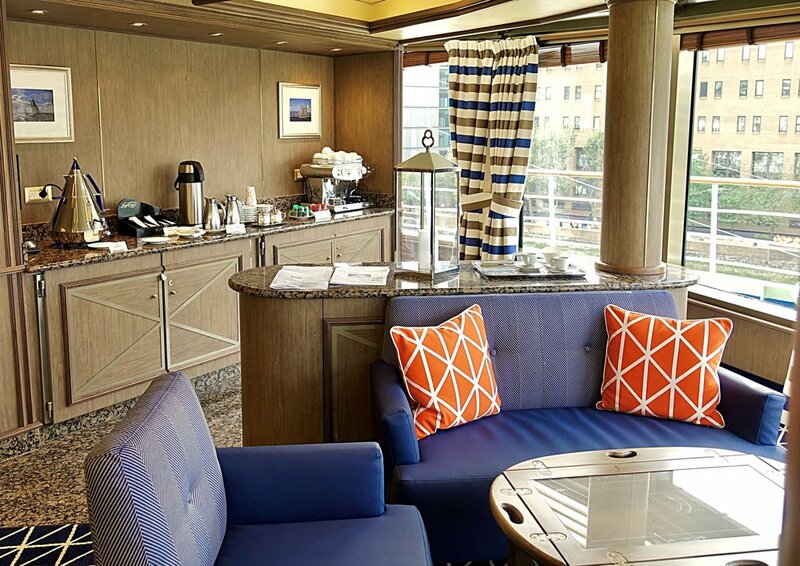 Inside, the panorama lounge is obviously the hub of the ship with a large bar serving everything from speciality coffees to martinis and champagne, with lounge seating for whiling away hours at sea and a grand piano for those evening soirées. Tower Bridge from the Panorama Lounge deck. 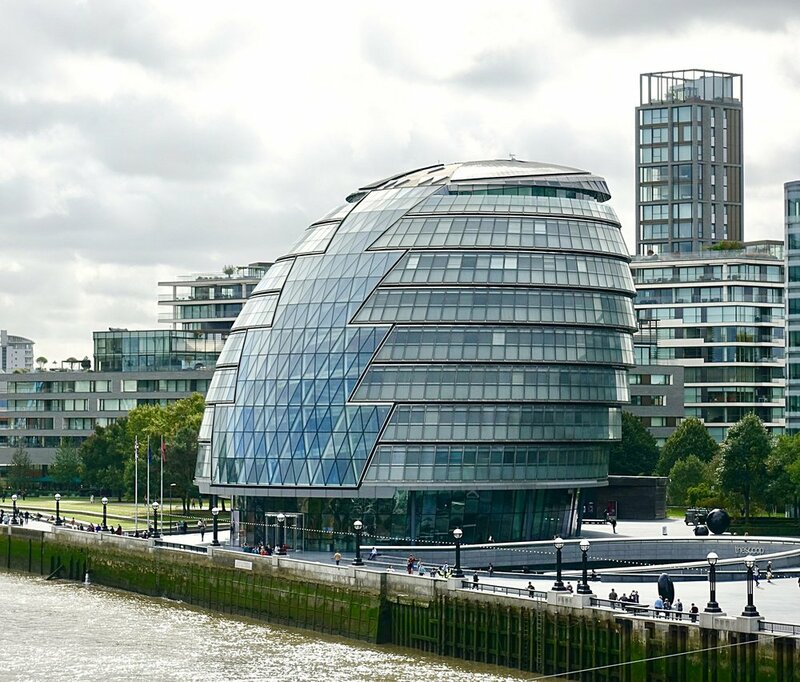 London City Hall from the Panorama Lounge deck. Its not often you have a view of the Tower of London as you sit round the pool! Whilst we could have stayed there all day we did have a ship to tour to do so we tore ourselves away to take a look at the rest of this pretty little ship. First we made our way to the central outside pool area which is situated on the same deck. For the size of ship we were pleasantly surprised by the pool which was a good size and flanked by two jacuzzis and plenty of padded sun loungers. There was a bar and grill for alfresco dining both during the day and in the evening when guests have the chance to cook their own food on volcanic lava stones. 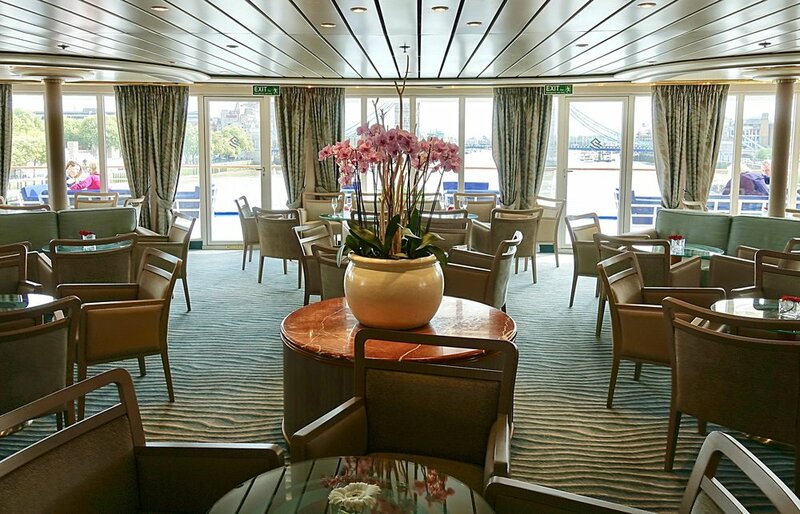 The beautiful Panorama Lounge, the hub of the ship. The Patio grill and bar. We then made our way to the deck above which is open to the pool below. At one end of this deck there is a jogging track and the other is partly occupied by the small spa and gym area. There are a number of treatment rooms and a small salon along with the changing rooms. 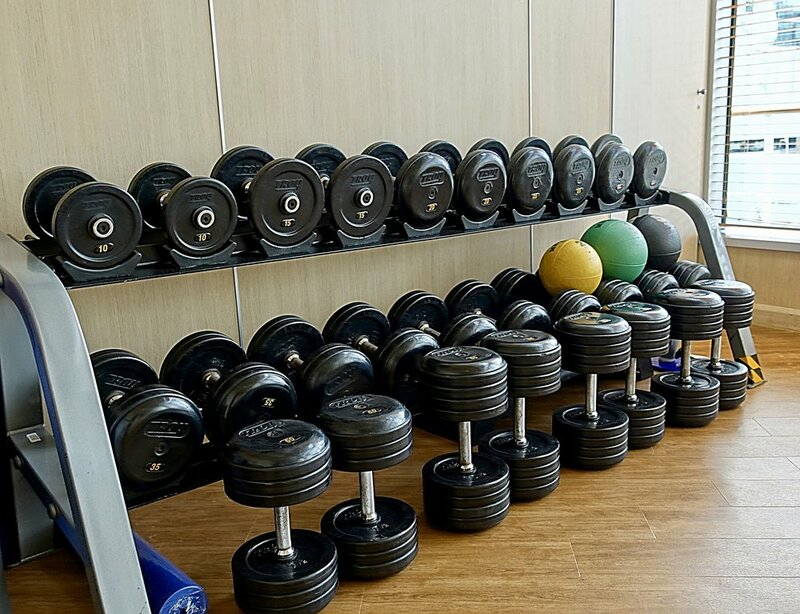 The gym is surprisingly spacious and well equipped for a ship this size and is accompanied by a rather useful weights room, though we suspect this may feel rather overcrowded if occupied by more than one person at a time. A rather serene looking treatment room. Beyond the gym and spa area, sitting on the deck above the bridge is the Tors Observation library, named after the founder of Viking cruises, Torstein Hagen, who reciprocates this by having a restaurant on each of their ships named ‘Manfredi’s’ after the owner of Silversea. Up here one can savour the panoramic view whilst lounging with a good book or magazine and helping oneself to a snack and drink from the little self service bar. The Tors observation lounge seating. The Tors observation lounge self-service bar. The Tors observation library area. Back down at deck 7 at the aft of the ship, with lunchtime approaching, we were taken into the Terrazza buffet restaurant and boy did the food look amazing. For such a small ship there was a wide variety of food on offer and it all looked very tempting. This is the casual eating venue with a lovely outside terrace to enjoy in those warmer climates. The clever design of the food station in this restaurant means that buffet area can be shut off in the evening so that the restaurant can become the casual dining option with full table service, still with access to the outside dining area. Food, food and yet more food! Some very delicious salads, my favourite part of any buffet, yum! Down one more deck and we arrived at the show lounge where all of the evening entertainment takes place. Unusually for such a small ship is has staged seating which we loved and the whole theatre felt very grand despite its size. Rather handily the main bar is situated just below the lounge area and is where one would go for a pre or post dinner drink. This deck also houses the casino and the boutiques. The main bar located on deck 5. 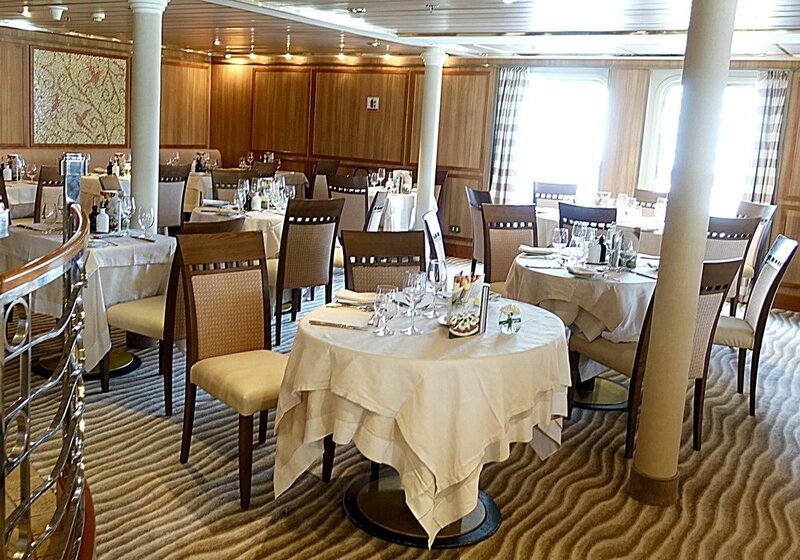 Silver Wind has only one speciality restaurant, called La Dame, the only Relais and Chateaux restaurant at sea. This is an intimate, reservation only restaurant with a $60 per person cover charge and features specialties such as foie gras, lobster tail, Limousin beef and Dover sole. Although Silver Wind is an open bar ship serving alcoholic and non-alcoholic drinks in any bar throughout the day, when dining in La Dame patrons will receive premium wines exclusive to that restaurant. From what we saw it would definitely be worth a visit to here at least once in a voyage. The main restaurant is situated next to La Dame and is large enough to seat all of Silver Winds guest thus allowing for open seating dining. A thoughtful gesture is the subtle wooden box located just inside the entrance to the restaurant housing a variety of different strength reading glasses for those guests that have forgotten to bring theirs. And believe me you will want to be able to read the detail on these menus if our lunch was anything to go by. We had a four course lunch comprising of a tuna tartare and avocado starter, a swordfish and artichoke fish course, a beef tenderloin and polenta mash meat course, finished off with a brandy basket full of mixed berries in a cream sauce, and all accompanied by well paired wines. 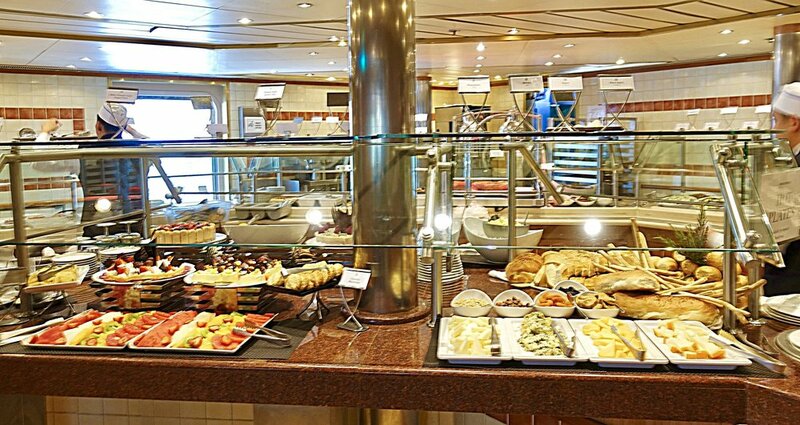 This truly was one of the best lunches we have ever had on a ship, if this was anything to go by mealtimes would quickly become a real highlight of the voyage. And so with lunch over our day came to an end and it was time to disembark. Unfortunately we had not been able to see any of the staterooms which was a real pity since I’m sure they are as spacious and luxurious as the rest of the ship feels. This is a small ship but has a very open and airy feel about her. She is due to go into dry dock in a couple of months time to be fitted out in the same style as her newer, larger and more contemporary sister, the Silver Muse. 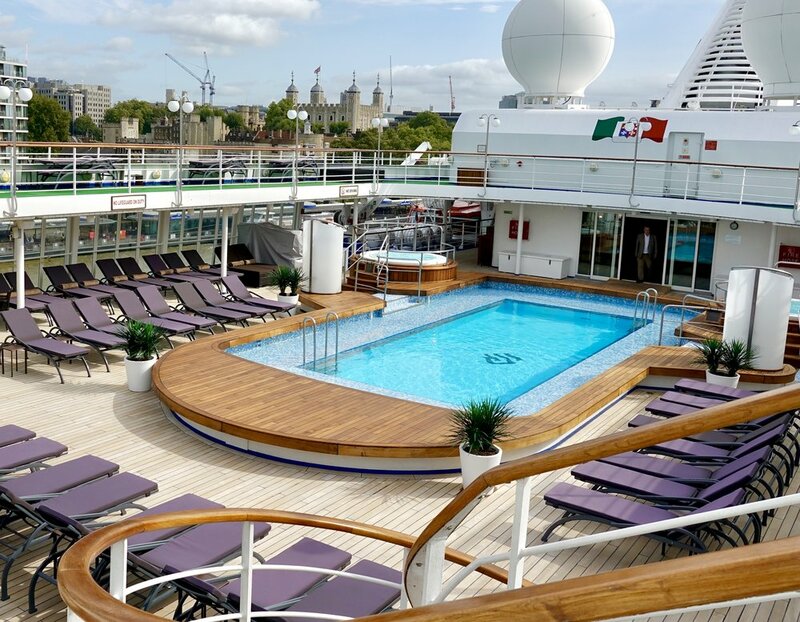 The recent Royal Caribbean Cruises acquisition of the majority of Silversea shares has allowed for a more significant investment in this refit with more areas and all suites now in line to be overhauled. 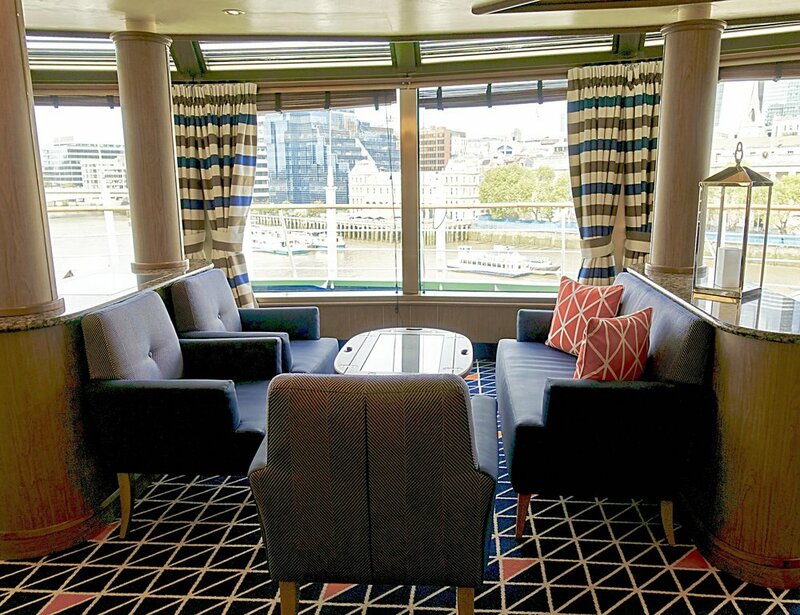 The classic design and decor of the ship was in great taste but we look forward to seeing how she will look after this ‘Musification’, which looks to be much more contemporary and modern in design. But from the few short hours we spent on her she definitely was somewhere we would like to spend more time, and who can resist when her itineraries include unique ports of call like this. If you enjoyed this then why not take a look at our Silver Spirit Caribbean cruise review. 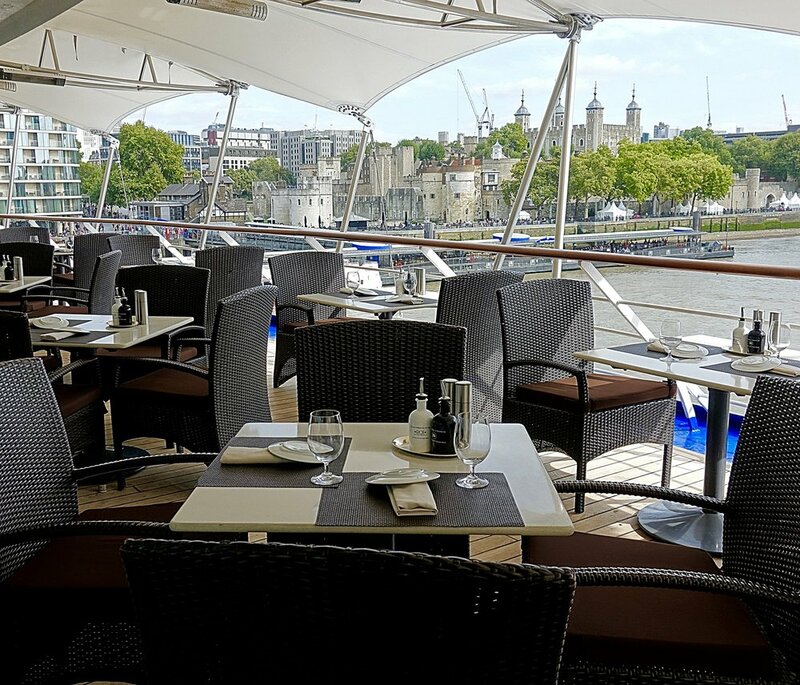 Thank you to SilverSea for inviting us on board for the day to visit the Silver Wind while she was docked at Tower Bridge, London.